I think we all understand the problem with plastic. 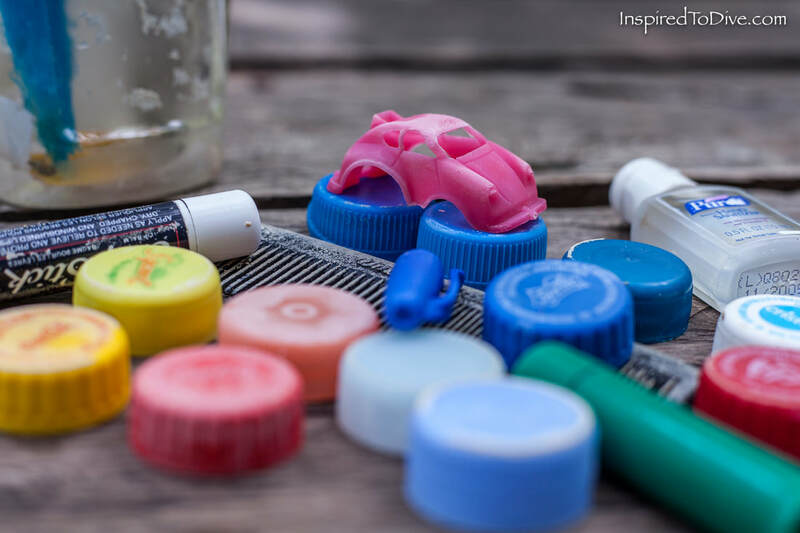 Many of the disposable plastic items we use in everyday life are made from a material that lasts forever. These items don’t break down, they break up, into smaller and smaller pieces. Plastic is ending up in our oceans and our marine life. It’s finding its way into the food chain and the fish we like to eat. Much to my horror, I have discovered that plastic is finding its way into caves too. 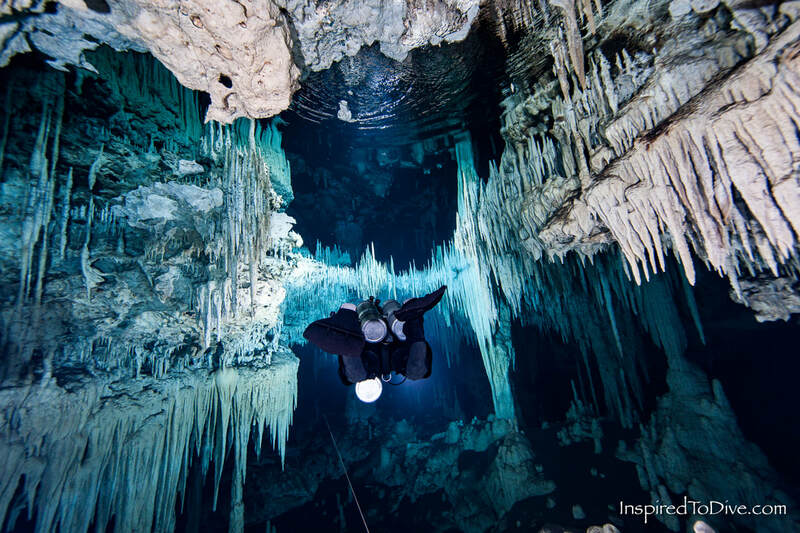 I recently spent a couple of months cave diving in Mexico. 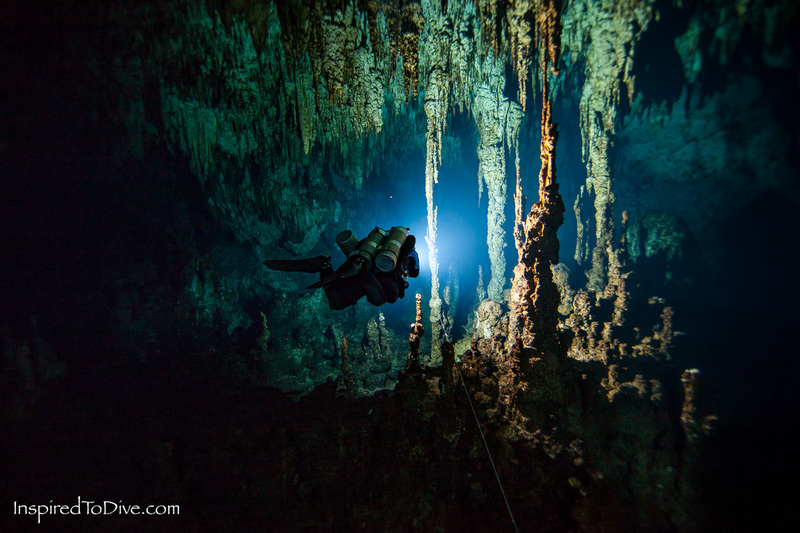 The Yucatan Peninsula is a mecca for cave divers. 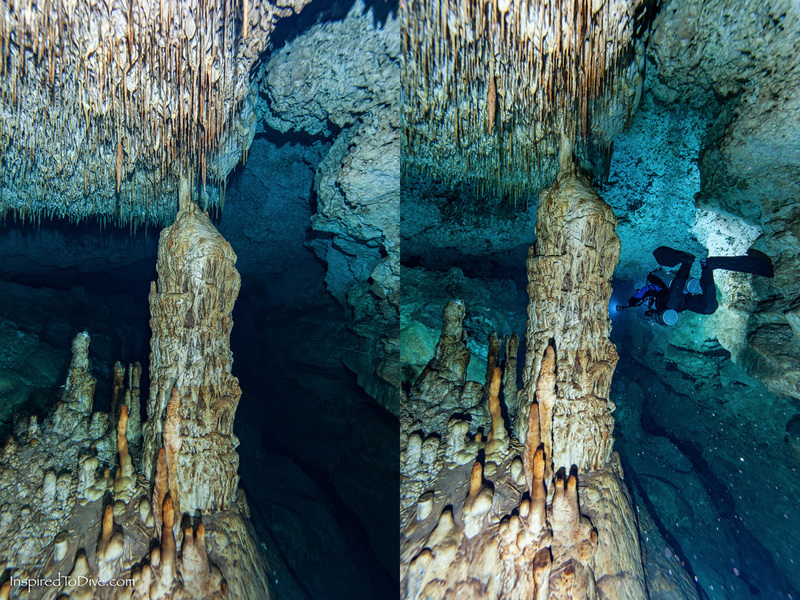 Hundreds of kilometres of underwater caves connect hundreds of cenotes. The underground aquifer is amazing and I feel fortunate to have had this amazing experience. The water in the caves is often crystal clear. 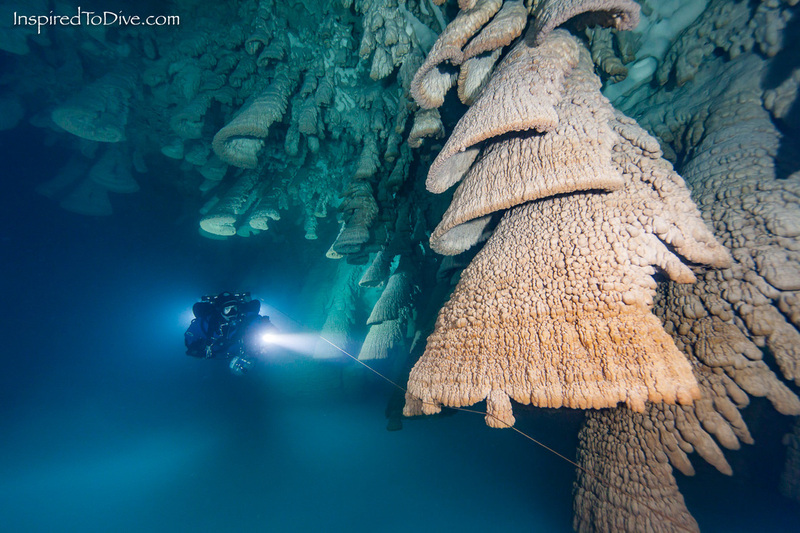 People comment on my underwater photos “is there even water in there?” Swimming through the cave, you can imagine you’re swimming in a pristine environment. It may be an illusion though. Human activity on the land above the cave systems means that the water isn’t drinkable without treatment. Ear infections are common. On the last day of my trip I went for one final cave dive. I drove to the spectacular Cenote Nohoch Nah Chich. 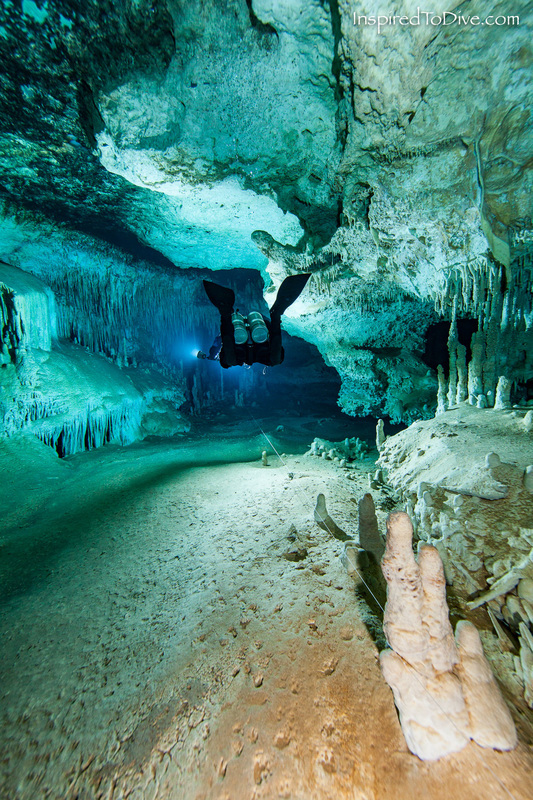 Nohoch is a very popular cave diving site. 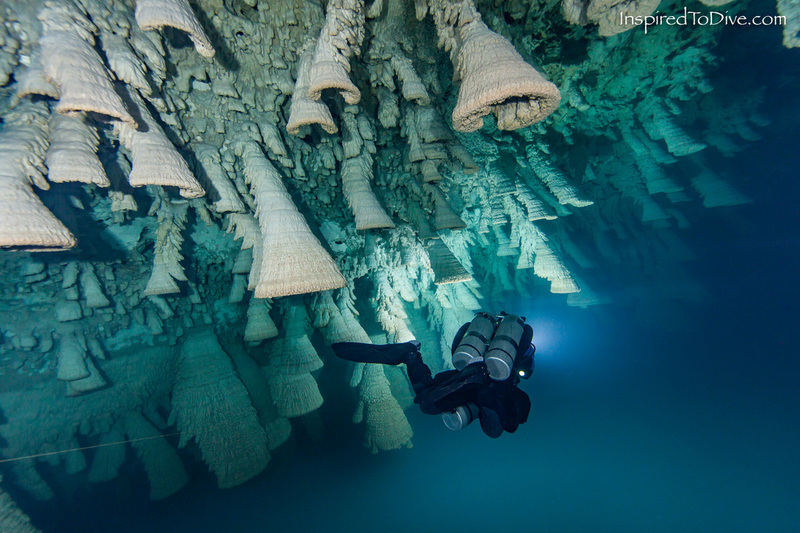 It has shallow tunnels decorated with elaborate white formations. The clarity of the water is breathtaking. 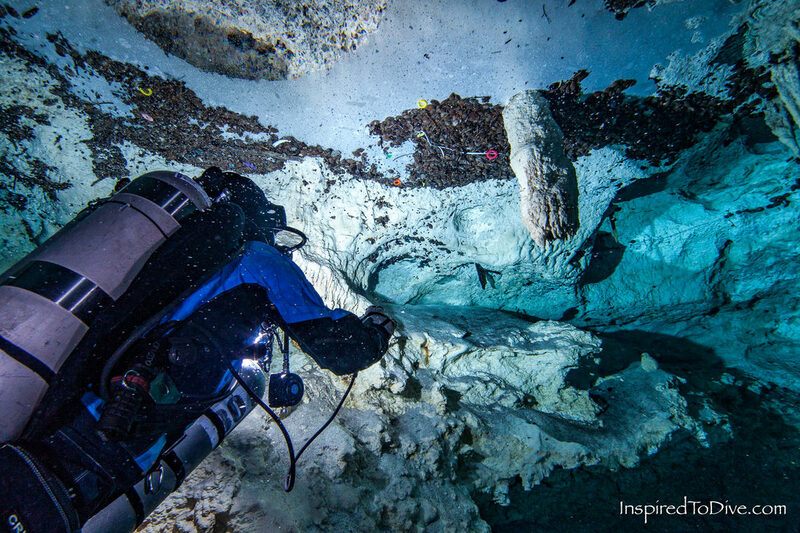 Most cave divers head upstream and I usually do too. This time I decided to go downstream. The downstream cave has a different feel. The silty floor is darker from organic material washing into the cave. The cave is punctuated with air domes. White columns clash with the dark floor. It’s beautiful. It’s also contaminated with plastic. Passing by an air dome, a flash of vibrant pink grabbed my attention. Playing my light across the water’s surface, I could see brightly coloured objects floating. They were caught up with crystalline calcite rafting and buoyant seed pods (both natural features). At first glance there were plastic bottle caps and those bottle security ties that you rip off a sealed water bottle before you guzzle it. There were brightly coloured objects I couldn’t immediately identify, except to say that it all looked like plastic. I kept diving but I couldn’t get my mind off the rubbish. I wasn’t about to leave it in the cave. On the way out I signalled my team mate Cameron, who is also my spouse. I asked him to join me and help me grab what floating plastic we could from the air dome. He wasn’t particularly happy about it, which I could understand. 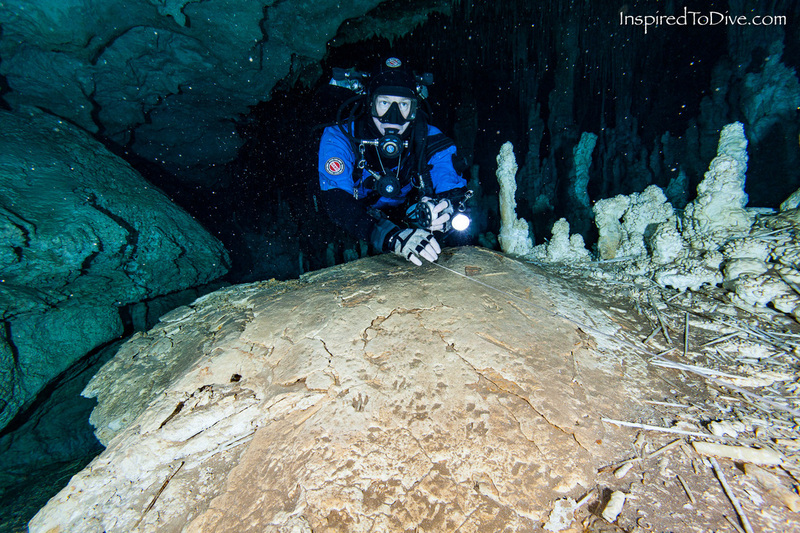 What cave diver wants their last memory of a great trip to be of collecting garbage? We collected as much plastic as we could stuff into our drysuit zipper pockets. This was a challenge; each time the zipper was opened buoyant fragments attempted an escape towards the cave ceiling. Cameron found a plastic bottle with a cap. 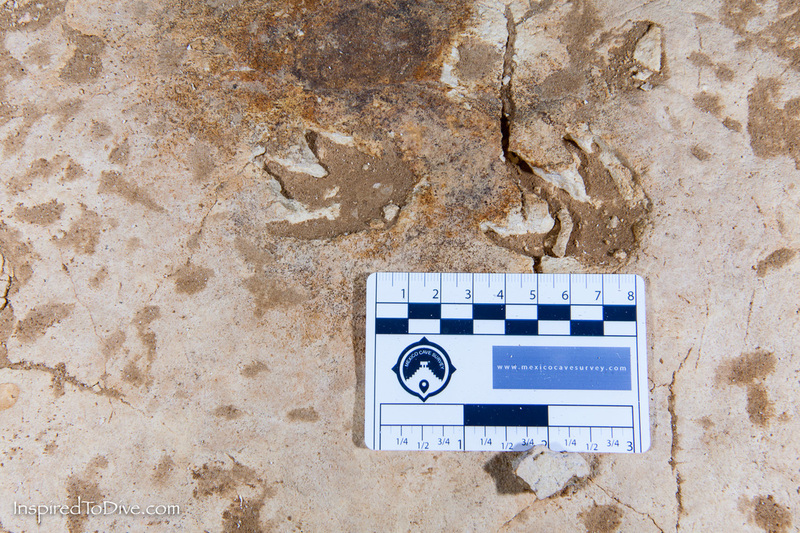 He was able to wedge this full of other plastic fragments for easy transport out of the cave. It was a miserable job. Not the collecting of the plastic. Simply seeing all this waste from human activity messing up a natural environment. I wondered… where is all the plastic coming from? 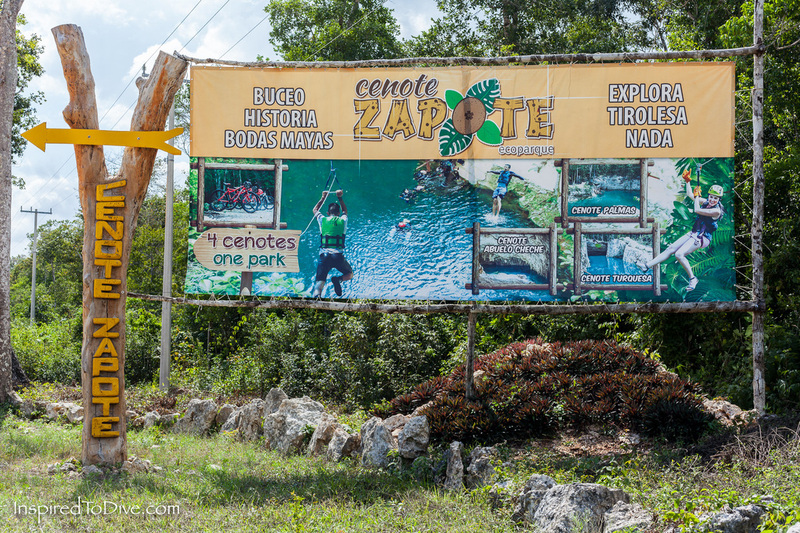 Cenote Nohoch Nah Chich is a popular tourist site. Snorkellers make up most of the traffic. 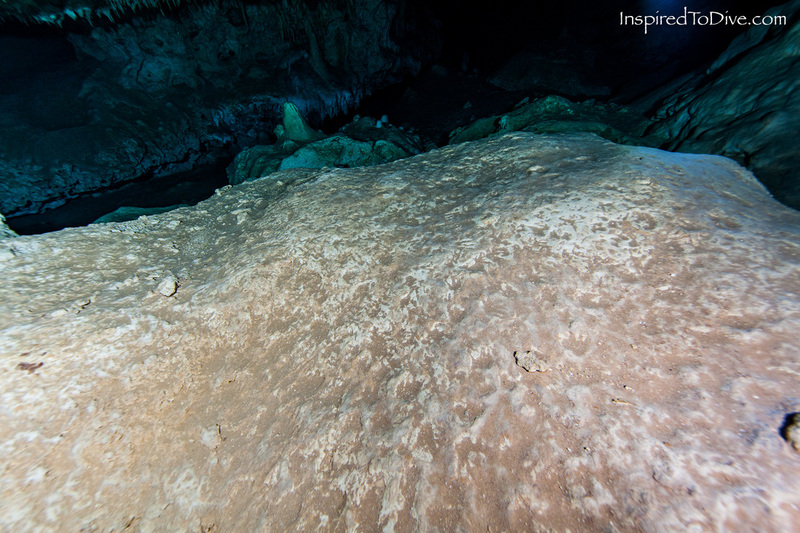 The cenote has a generous cavern zone where you can snorkel into the overhang. Perhaps those swimmers have plastic items in their pockets: chapsticks, hand sanitiser, pens and chocolate wrappers. I also collected twenty brightly-coloured plastic loops in the shape of springs. They looked like some kind of bangle. This fashion trend completely passed me by and they surely don’t belong in the cave. What can we do about this insidious plastic invasion? We can choose to refuse plastic wherever possible. Refill your water bottle from a trusted source every day instead of buying bottled water. Plastic bottle caps (from water and sodas) were the most abundant item recovered from the cave. We can all pick up litter even if it’s not our own. 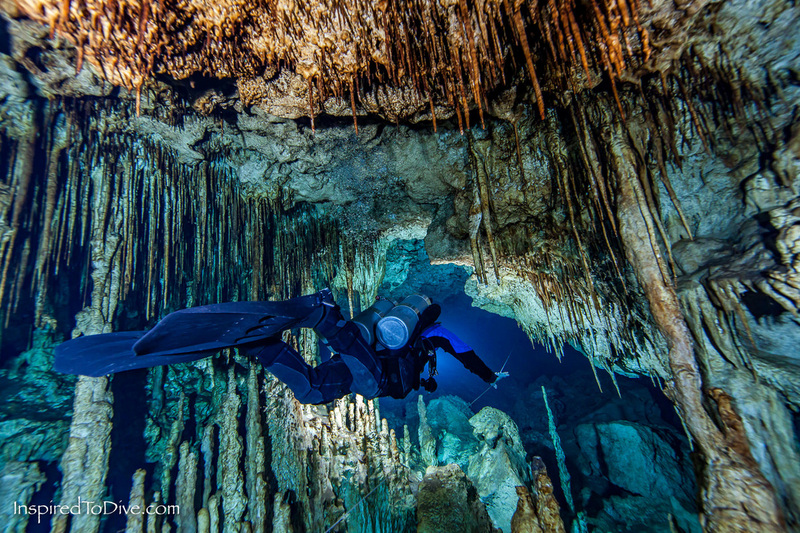 This is especially important around water such as the sea or freshwater sites like cenotes and streams. When it rains garbage is transported downhill to the water. It’s easier to keep water clean than clean it up. We can also spread awareness. There’s a global movement challenging our current thinking around how we use plastic in our lives. Plastic Free July is about motivating people to refuse single-use plastic items and find a way to live without them. There are really easy places to start, such as bringing your own reusable bags to the supermarket for your groceries. “It sounds like a pygmy pipehorse.” I thought I must have heard him wrong. I knew of sea horses, and pipefish, but a pipehorse – now that was a new one to me! 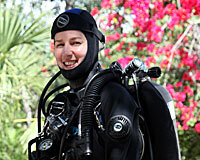 ​I’ve been scuba diving in New Zealand for over ten years; I’ve spent a lot of hours underwater. You might think that by now I must have just about seen it all. Here’s the thing: I haven’t. Not even close. I was enjoying a special Northland Waitangi Day in my own tradition - scuba diving. Drifting around underwater, I got to check in with a lot of my favourite fishes: red moki, blue maomao, grey moray, demoiselles and kingfish. I was in my happy place. The topography of the rocky reef lead me into a gully with a vertical wall on one side. I decided to spend the final minutes of my dive searching for nudibranchs, the colourful sea slugs that bling up the underwater world. 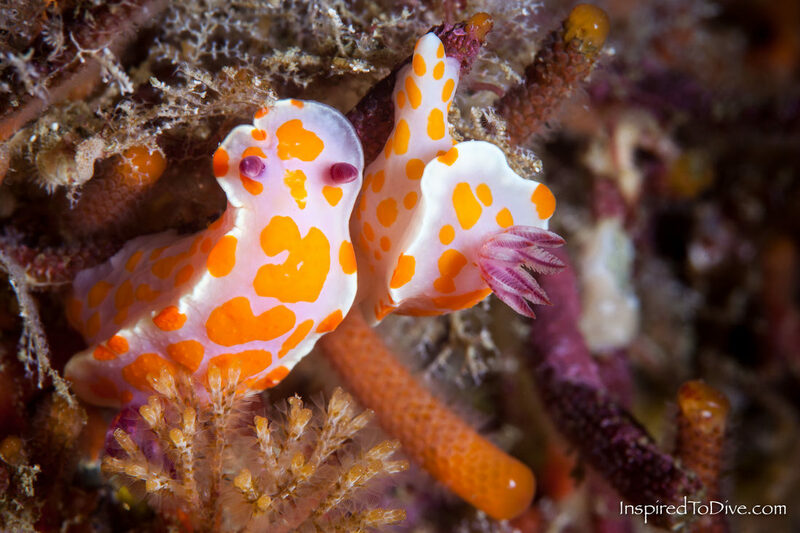 This is a pair of Clown nudibranchs Ceratosoma amoenum, one of the most common sea slugs from northern New Zealand. A fine brown silt covered the wall and all of the spiky bryozoans that decorated it. I used my dive light to return the natural colours and concentrate my eye towards anything gaudy. A splash of saturated pink, a jerky movement, and I was immediately fixated on something utterly unexpected. It was small and brightly coloured. It was not a nudibranch. I did a double take. It was a… sea horse. I tried to take a couple of photos. The sea horse was shy, it turned away from me and my underwater flashes. I wanted to get a good identifying shot because the sea horse didn’t look like any sea horse I’d ever seen in New Zealand before. The bright pink colouration with patches of white, the back tassels, the diminutive size - I’d never seen anything like it. Then I realised there were two! Where one of the pair was intensely pink-red, the other was brown, mottled and muted. It was all but invisible on the silt-covered wall. I checked my dive computer; I didn’t have much time. My boat skipper Shane from Northland Dive was going to be expecting me back at the boat any minute now. I tried again to get some shots, frustration mounting. Normally I wouldn’t persist with such a shy animal, but this was necessary for identification purposes. All I was getting were some nice photos of the back of their heads! The next step to solving the mystery of the weird sea horse was to hunt around online for clues and connect with an expert. I remembered seeing a photo from my friend Crispin Middleton from Seacology in the last couple of years, so I went to Facebook. In 2014 a sea horse was trawled from the Northland sea during a NIWA survey of coastal sea life. It was exciting because it could not immediately be identified. It was not the known New Zealand sea horse Hippocampus abdominalis, which meant it might be something new, at least for New Zealand. 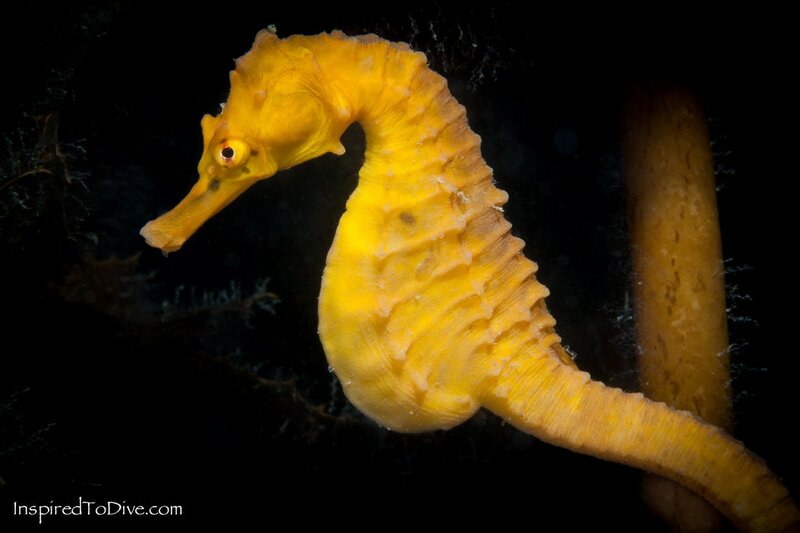 Less than one year later a photo of another unusual sea horse was posted on Facebook. The discovery was made by Justin Ricketts and the photo was taken by Kent Ericksen of Oceanblue Adventures at the Poor Knights Islands. The report says there were two animals, tails intertwined – just like my sighting. The photo showed similarities with the photos I had taken, particularly the cup-shaped hump on the head and colour (note colouration can be highly variable and is not necessarily an identifying feature). I phoned sea horse expert Chris Woods from NIWA. I explained what I had seen and he said it sounded like a pygmy pipehorse. I thought I must have heard him wrong. 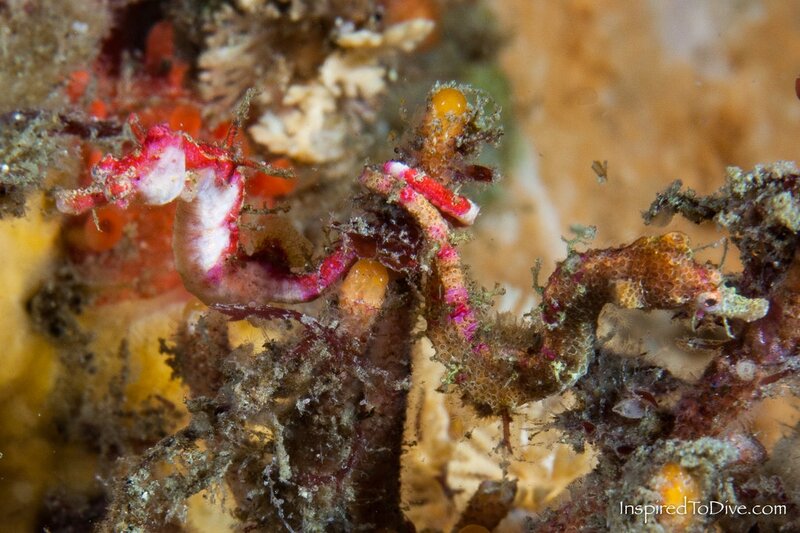 I knew of sea horses, and pipefish, but a pipehorse – now that was a new one to me! 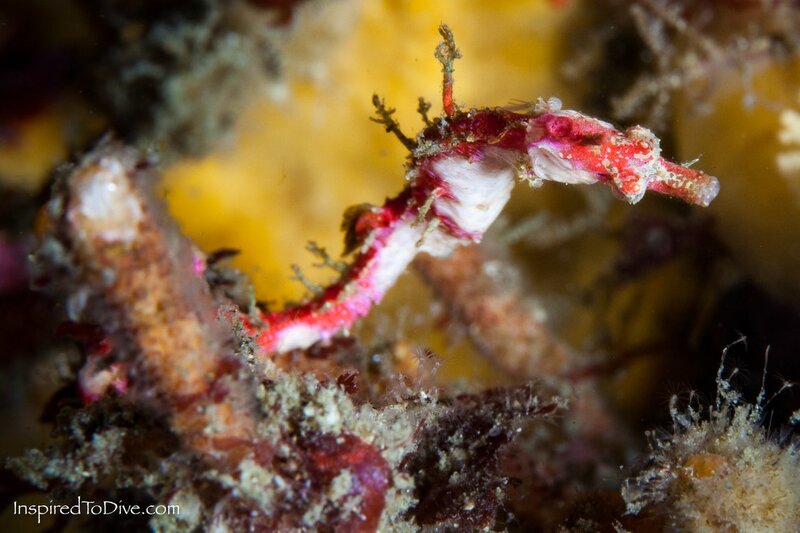 I emailed photos and he came back to me: “your pygmy pipehorse looks very much like Acentronura australe known from one specimen from the Bay of Islands, but as we have very limited knowledge of this group (especially from NZ) pinning it down to species is difficult”. 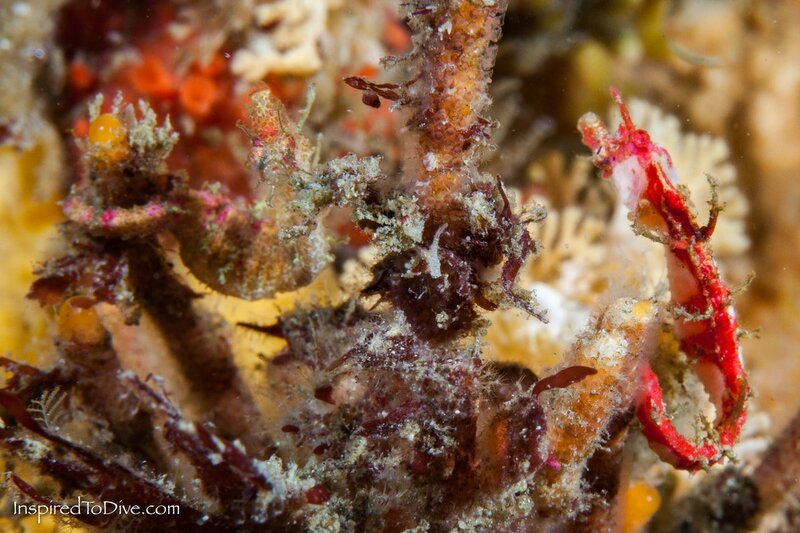 Can you see both pygmy pipehorses in this photo? They're small, <5 centimetres. This is the New Zealand sea horse Hippocampus abdominalis. It can be up to 30 centimetres long. This is a pipefish from New Zealand... not to be confused with a sea horse or a pygmy pipehorse. This animal looks long and slender like a stick. 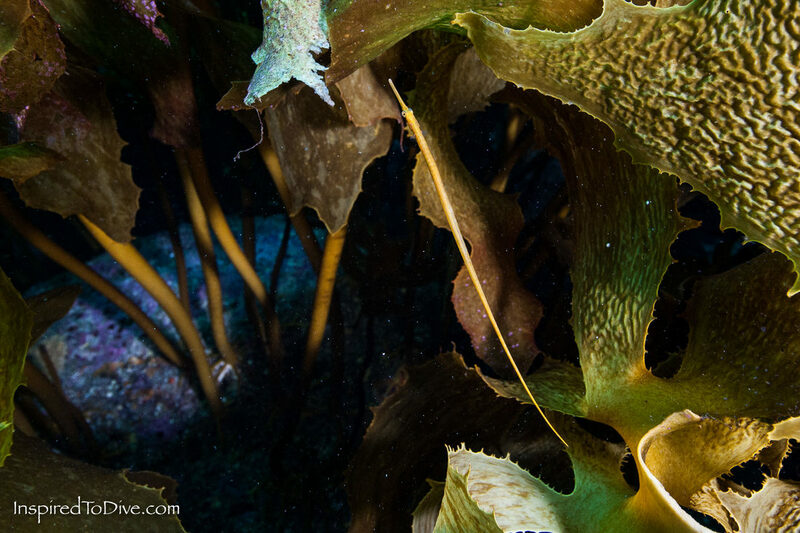 It tends to hover around the kelp rather than hold on with its tail like a sea horse or pipehorse. Many thanks to Julia Riddle and Shane Housham from Northland Dive who allow me to do the long dive times that make these discoveries possible. Thanks to Shane Housham for contributing images to assist in the identification of the pygmy pipehorses. Thanks to Chris Woods from NIWA and Andrew Stewart from Te Papa for their expert opinions on this discovery. If you suspect you have seen a pygmy pipehorse in New Zealand please contact Alison Perkins from Inspired To Dive. Take photos and note the location! 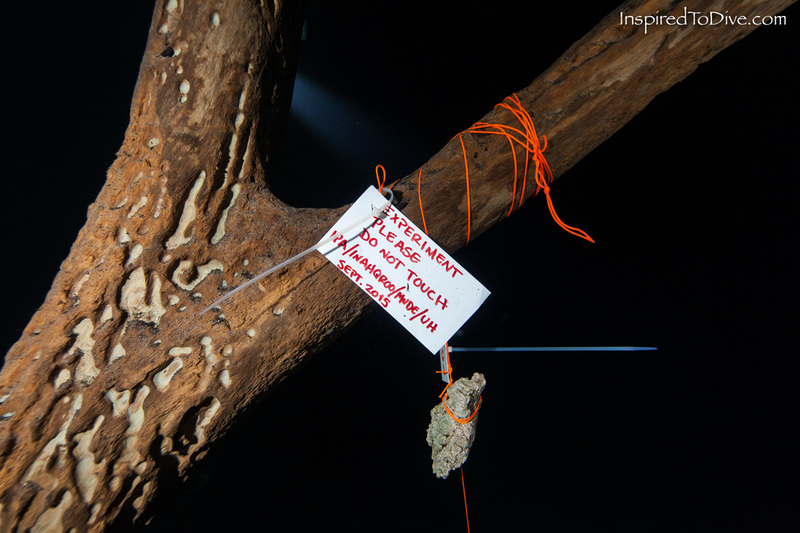 All photos in this article are copyright Alison Perkins www.InspiredToDive.com and may not be printed without prior written permission. Update 15/02/2017: Shane Housham and Julia Riddle find the pair of pygmy pipehorses again and Shane takes some incredible photos! A swell is rolling. The sea is a tumultuous mess. You know that the environment for underwater photography is going to be surgy as hell. What techniques can you call on when conditions crap out? Here are the methods I use to shoot great photos in surgy water. In a perfect world there’s nothing but calm seas, infinite visibility and water of the purest blue hue. Every underwater photo you take is a winner. If you live in that world you are one lucky sod! The New Zealand that I call home is wonderful, but far from perfect. Sea conditions are widely variable and sometimes borderline undiveable. If I hung out waiting for perfect conditions it would be a long drink between dives. Instead I’ve worked on some ways to cope with the surge and still capture some nice pictures. If you’re shooting with a camera that has interchangeable lenses then you’ve got a decision to make: macro or wide angle? This is a tough one. No matter what you choose it will feel wrong the second you splash into the water. Make a call and make it work. In my experience surgy conditions generally cause a reduction in visibility. All that thrashing water stirs up sediment and fills the water column with particles. It’s a backscatter nightmare. For this reason I lean away from wide angle towards macro. Say you pick macro - imagine trying to photograph a button in a washing machine. Shooting small subjects in surgy conditions is enough to make any hardy underwater photographer sob with frustration. I guess you’d say I like a challenge. Start popping those seasick tablets like they’re party pills – you’re heading offshore. Reefs and islands accessible by boat will have better visibility than shallow beach-access sites where the sandy bottom is stirred up. On a typical photographic dive in good conditions I look for an interesting subject or scene and set out to capture it. Surgy conditions demand an alternative approach. I try to find a good location in which to shoot, and then search for an interesting subject within it to focus my efforts on. I may spend the majority of my dive in this one location. What makes a good spot? Look for a sheltered site where you can get out of the worst of the wash. A wall that is free of overhang (head and valve-bashing obstacles) with good space so that you can be swept side to side without being impaled is a good place to start. Allow generous space behind for your fins to move - never have they been more important stabilisers than in surgy conditions. 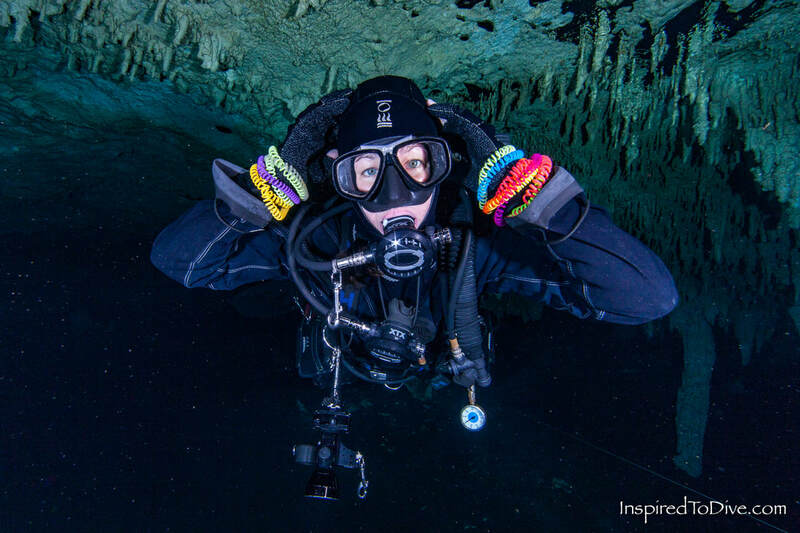 You're underwater ready to take photos, now what? Take a couple of minutes to evaluate the motion of the ocean. Are you being propelled up and down, side to side, forwards and back, or a combination? Surfers learn to read waves. Scuba divers can get a feel for the swell on any given day. Wait for momentary lapses in water movement to fire off your shot. Be ready for the extra big lift that sweeps you off balance. Look for potential hazards that you may be emphatically tossed upon: rock, reef, spiny urchins, and camouflaged scorpionfish. Avoid those. Shoot at arm’s length. If you find yourself suddenly propelled forward you have a little extra room to prevent impact. Yank your arms in and hug your camera to your chest. Protect your ports. Dive with slightly negative buoyancy. Break horizontal trim to roughly thirty-five degrees. Use a gentle upwards kick to hold position against vertical water movement. Don’t forget you’re negatively buoyant. As soon as you pull back and pause to review your photos you will start to descend - don’t get so caught up in reviewing images that you don’t notice. Keep the reef in your peripheral vision and pay attention to any increasing pressure on your ears. Add a couple of quick bursts of gas to your BC to regain neutral buoyancy. Consider diving deeper and shoot below the swell. Conditions at 5 metres might be yuck, conditions at 15 metres average, conditions at 25 metres better. Be prepared to adjust your gases and tank capacity to accommodate such a choice. Will you be comfortable holding decompression stops? Be flexible with composition. It’s tricky to get your elements lined up just right when you’re flying past your subject. Now is a good time to get creative. Fighting surge is exhausting. Check your pressure gauge more often if your breathing rate is up. 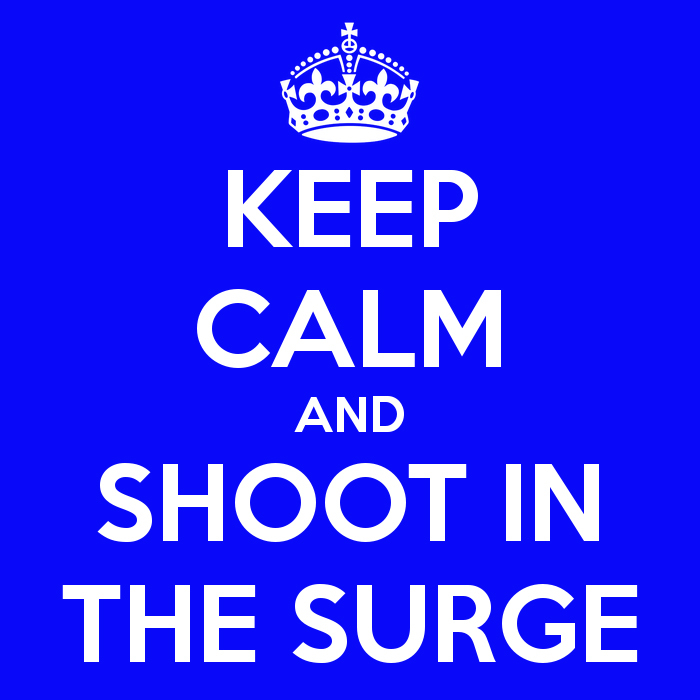 Going with the water rather than fighting it is more comfortable for prolonged shooting. A stem of kelp may seem like a great handle to hold you in position but if you try to fight the movement of the water in this way rather than go with it you can risk being flipped over. Frustration is finding a great little subject to photograph and then losing it as you’re swept a couple of metres away when a wave passes through. Memorise larger recognisable features around your subject to orientate you in the right spot to relocate it over and over again. Be patient. The 5 minutes you may need to spend with a subject in good conditions can easily become 25 minutes in bad. Keep calm. Take your time. Review your images. Have you got a shot in focus? A solid back kick is an essential skill. The ability to move in all directions using your fins leaves your hands free to stabilise your camera and fire off the shot at the critical moment. It’s nerve wracking placing your expensive underwater camera close to damaging elements when you’re at the mercy of a big sea. But if you don’t get close you won’t get a good image. Average conditions are no excuse for average skills. No touching is good practice regardless of the situation. Treat the underwater environment with respect. Unless you live in a perfect world then a good chunk of every year is likely to be spent diving in average situations. While you may not create an award-winning photograph in surgy conditions, this is guaranteed if you stay at home. It is possible to take interesting underwater photographs in the surge if you’re prepared to work at it. Learn to adapt, experiment and above all have fun. The images in this article were taken in sloppy seas with some serious surge. What techniques do you have for shooting in surgy conditions? Share your ideas in the comments below. 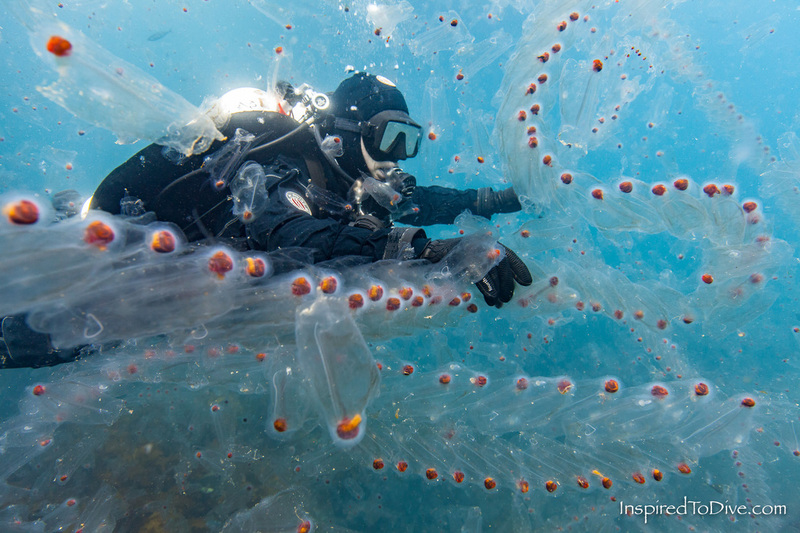 Salps are translucent barrel-shaped animals that may live singly or form colonies metres long. They move through the ocean filtering plankton by pumping water through their gelatinous bodies. One fine spring day in November in northern New Zealand I descended into a salp soup at the Poor Knights Islands. Salp populations had exploded with the abundance of plant plankton food. This is what I found. Video doesn't automatically play in HD quality - click through to Vimeo for best quality viewing. The innocent salps face hostility. Many scuba divers don't appreciate the reduced visibility that comes with the phytoplankton bloom and consequent salp occupation. They're slimy to look at and the touch of a salp brushing bare skin will send a shiver down your spine. The alien invasion doesn't last long and as quickly as they appeared the salps can be swept away by ocean forces. Before you know it you're missing those crazy plankton hoovering vacuum cleaners and their jaunty jet-propelled motion. 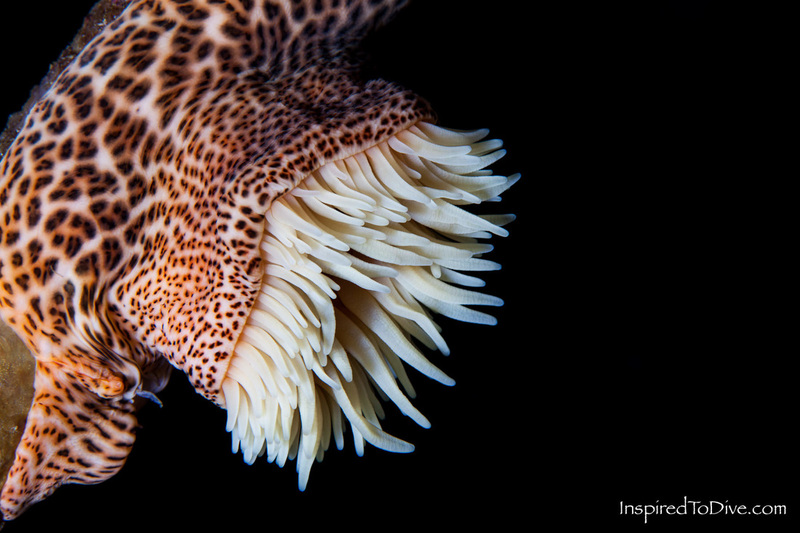 Careful... you might develop an appetite for the wonders of our weird wild ocean. In a press release from Facebook today, the company announced it will be trialling a new range of buttons to complement the famous Like indicator. While the full range of new-fangled emotion emojis is being kept under wraps, Facebook did reveal the first feature from the set, called the 'your post made me feel off-colour ascidian emoji'. Facebook CEO Mark Zuckerberg explained "we need more sea creatures on Facebook. Sure you’ve got the cute dolphin, whale and fish emojis, but what do these even mean? 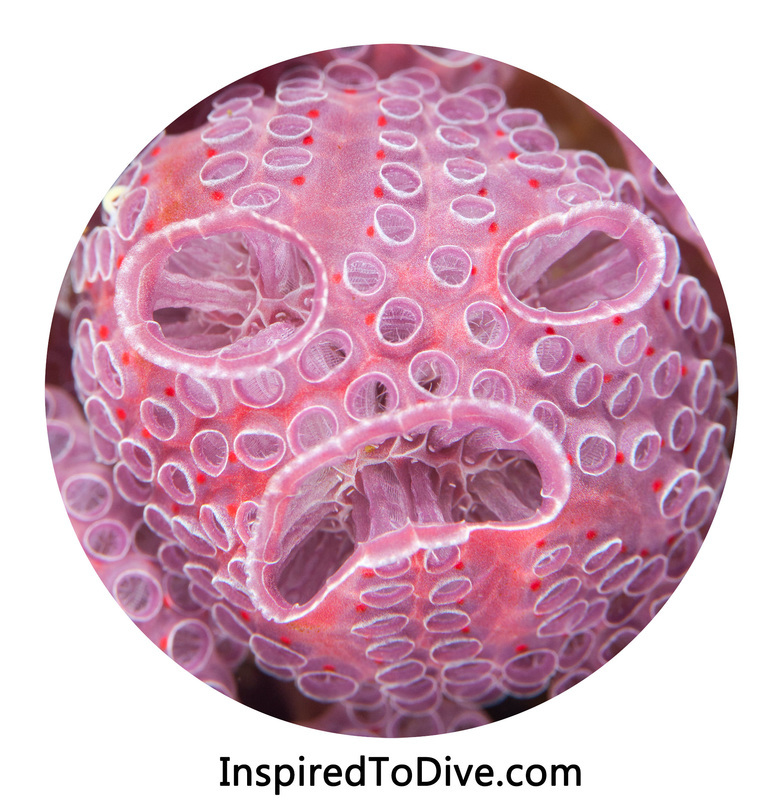 Our ascidian emoji combines real ocean life with emotion." In February 2015 I reported a 'Remarkable new sea slug find for New Zealand' on my blog. I am happy to update you with the news that Paul Caiger's discovery of Ercolania boodleae in New Zealand has been published in Sportdiving Magazine. Willan, R.C., Perkins, A.J. & Caiger, P.E. (2015). Boodlea baffles biologists. Sportdiving Magazine 169: 74-76. The article has been sent to Professor Hamish Spencer for incorporation into the Checklist of the Recent Mollusca Recorded from the New Zealand Exclusive Economic Zone (http://www.molluscs.otago.ac.nz). The article has also been sent to Lisa Marie, Incursion Investigator with the Ministry for Primary Industries (MPI). MPI is interested in any new-to-New Zealand species - plant, animal or disease. They have staff on duty 24/7 for terrestrial and marine reports. If you ever find a new critter or witness a mass mortality event (e.g. fish stranding), phone MPI on 0800 80 99 66. MPI are happy to check things out and have laboratory facilities for investigating suspected diseases. We don't need any more pests in our marine space. A risk assessment will be performed on Ercolania boodleae to determine if there is any threat to our environment. Many thanks to Lisa from the Surveillance and Incursion Investigation (Animals and Marine) Team, it's great to know they've got our back. I'm thrilled that this story has had a happy ending. For a while it looked like finding a place to publish this discovery would allude us and we would have no official record. Dr Richard Willan has done a fantastic job writing up this discovery and securing publication in Sportdiving Magazine. Thank you Richard and Paul! Found something? To report an suspected exotic disease or pests in animals, plants, fish or bees, call the Ministry for Primary Industries on 0800 80 99 66. 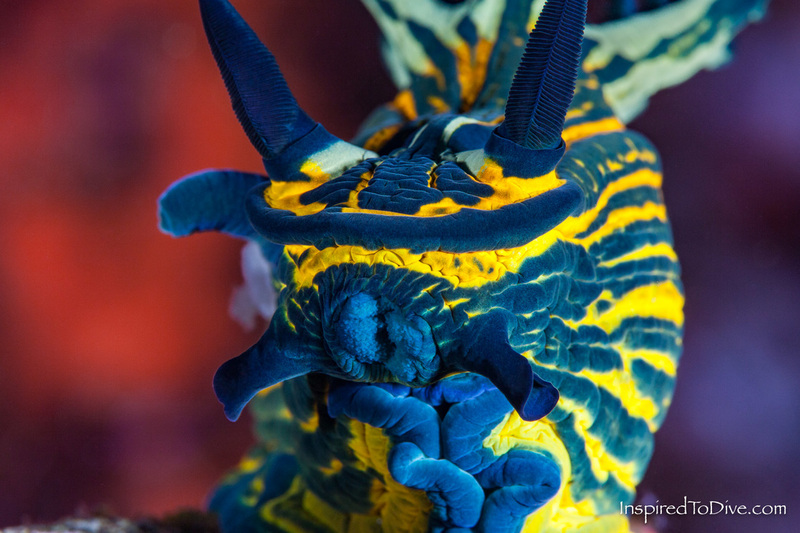 Nudibranchs - those brightly coloured sea slugs that remind you of coloured popcorn - don’t live very long, so a species that is abundant one month may be difficult to find the next. It helps to know who is seeing what and where so you can be on the look out for new, exciting, rare or different species. 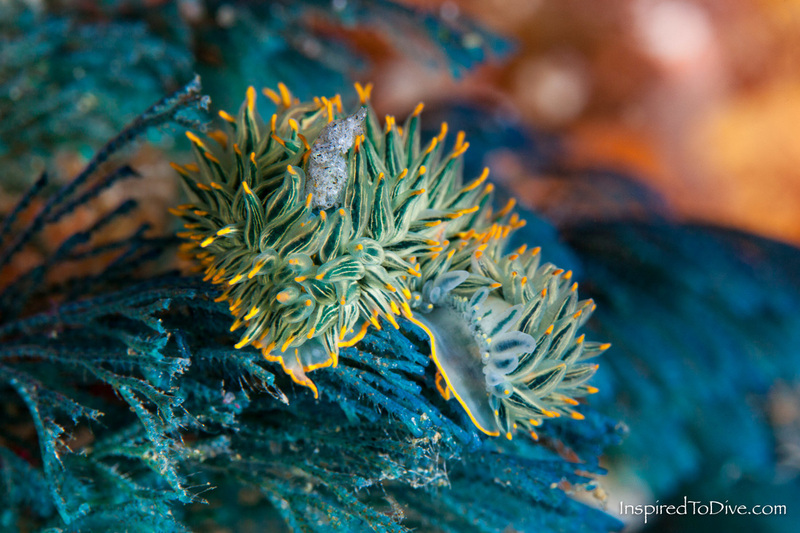 Here is an update on nudibranchs at the Poor Knights Islands. It's not meant to be an exhaustive list; the islands are huge and the range of nudibranch habitats is extensive. This is my summary of what I was excited to see during the month of August. If bigger is better then New Zealand is really delivering the goods right now. Forget those teeny tots from the tropics, we grow our nudibranchs cigar-sized. 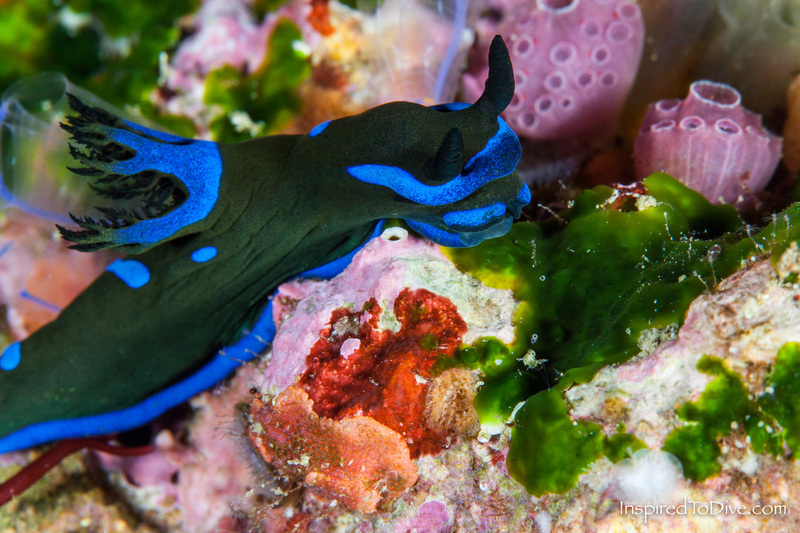 There have been regular sightings of the Gem Nudibranch (Dendrodoris denisoni) with its pale brown protuberances and brilliant blue spots, the velvety Verco’s Tambja (Tambja verconis) and the gloomy light-sucking Morose Tambja (Tambja morosa) with its electric blue highlights. No magnifying glass required to spot these monsters. 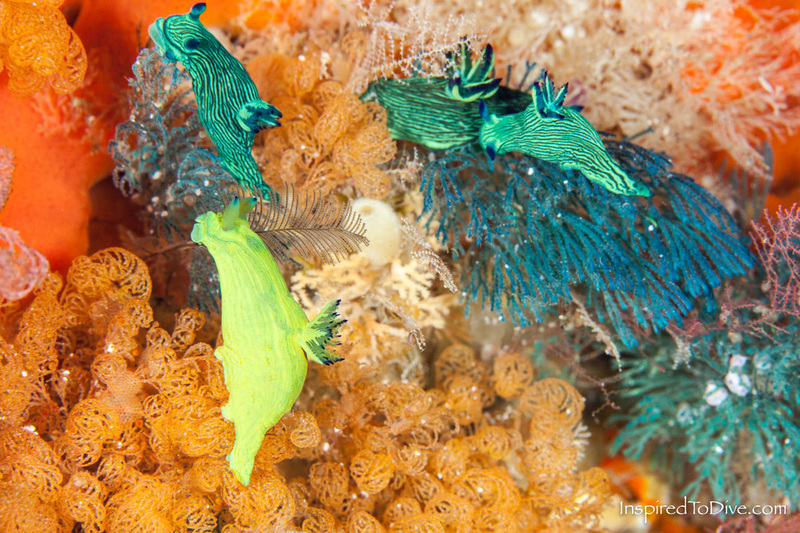 If you’ve never had the patience to wall gaze long enough to find a nudibranch the size of your little finger nail, then these beauties are for you. Don’t get overconfident though, surprisingly the raucous mustard golds and electric blues of these sea slugs are great camouflage on the bright bryozoan-colonised walls that are typical of the Poor Knights Islands at this time of year. That being said, if you can’t spot one or two of these chunky beasts then you may as well give up now and go wreck diving. Dare I say that we are experiencing a plague of the Fine-lined Tambja (Tambja tenuilineata) right now? The walls of Middle Arch are alive with these mid-sized nudis. Look out for the interesting variant of this species that is displaying a pale green to yellow colouration with diminished stripes. 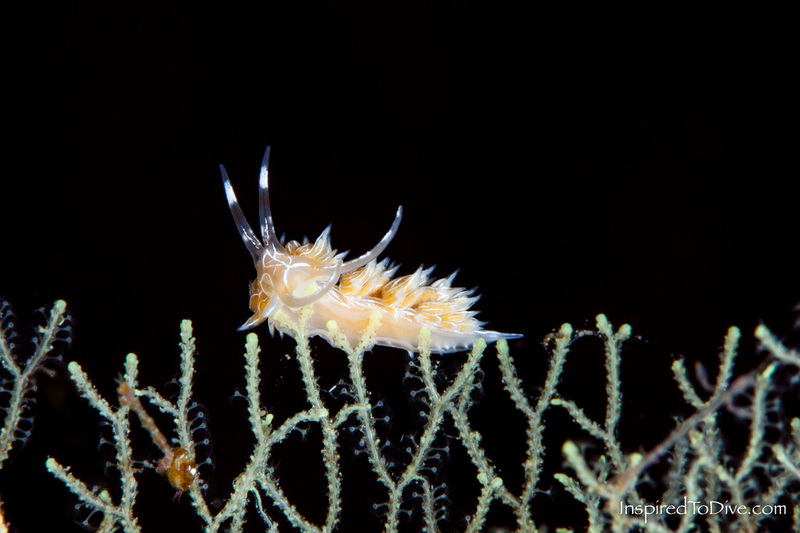 Take out your underwater light and wait for the sun to descend, a night dive will introduce you to an entirely different catalogue of nudibranchs. The White-lined Cratena (Cratena lineata) has colonised the boulder area around the outside of Bernie’s Cave and Middle Arch at around 16 metres. Perhaps notable for its absence was one of my favourites, the flaming Red Janolus (Janolus ignus) - or as my autocorrect is trying to insist, the Red Jangles. 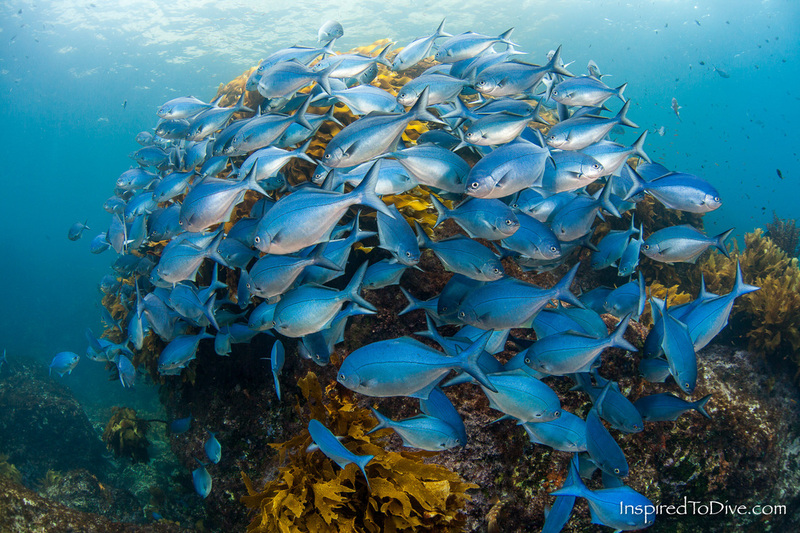 I did spot one confused cluster of Blue Janolus (Janolus mokohinau). After dark seems to be the best time to pursue these two species but I had little luck this month. In other mollusc news - hoards of small squid (<10 centimetres) were encountered while night diving around Middle Arch. They were playing an alarming game of charge and dash. From the black void they would rush my light, halt, splay their tentacles and reverse just as suddenly. The rapidity of their advances was fright inducing; avoid these miniature but bolshy squid if you have a weak heart. Discovered on Magic Wall during the day, a nudibranch that I had not met before. Tiny (<10 millimetres), obscure, the Brown Trapania (Trapania brunnea) is doing absolutely nothing to stand out from the crowd. If you have impaired eyesight, don’t even try to find this little bugger. If you’re up for a challenge, this is one to look out for. Not to be confused for a nudibranch, a mistake that I’ve made before (all nudibranchs are sea slugs but not all sea slugs are nudibranchs), the entrance to the Lost World (Jan’s Tunnel) is housing the sap-sucking slug Blue-spotted Elysia (Elysia sp. ), and a delicate white flatworm. I’ll need to return with a macro lens to capture these guys. We are now experiencing our winter low water temperatures around the country (~14 degrees Celsius in northern New Zealand). 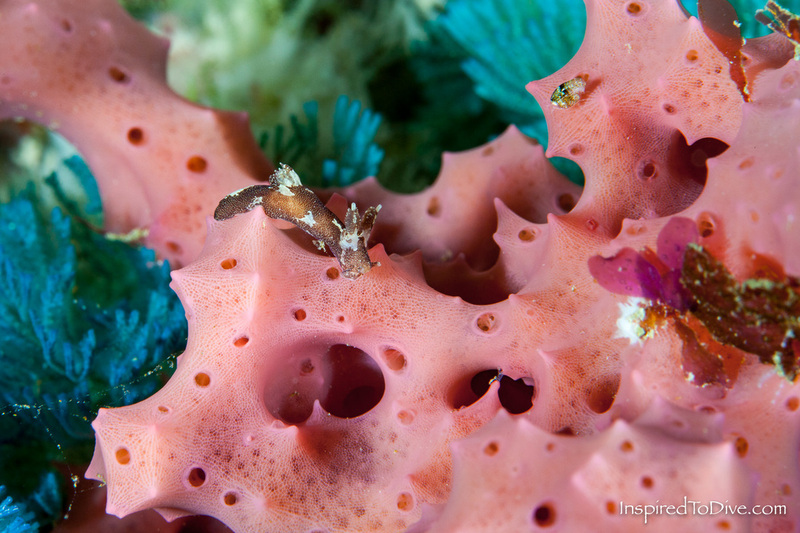 Nudibranch populations are booming so whack on an extra layer of neoprene or thermal undergarment and head out scuba diving to hunt down your favourite mollusc. Pucker up! Signing off with a kiss from Bordered Roboastra (Roboastra luteolineata). Thanks to Dr Richard Willan, Senior Curator of Molluscs at the Museum and Art Gallery of the Northern Territory in Australia, for his ongoing support and help identifying the molluscs I find. Have you seen any nudibranchs in New Zealand lately? Please share by making a comment below.